If you have GPRS or 3G connection available on your iPhone it is easy to install an application from iTunes using the internet. But if you don’t have internet in the iPhone you can use iTunes application to download and the required application to the iPhone. Here I will describe the steps to install the application through the iTunes application with screenshots. Launch the iTunes application and connect your iPhone to the computer with the data cable. Click/select on your device in the left hand side of the menu. Then click on the apps tab in the top menu. Then select the check box for the automatically sync new apps. Click on the iTunes store in the left hand side. 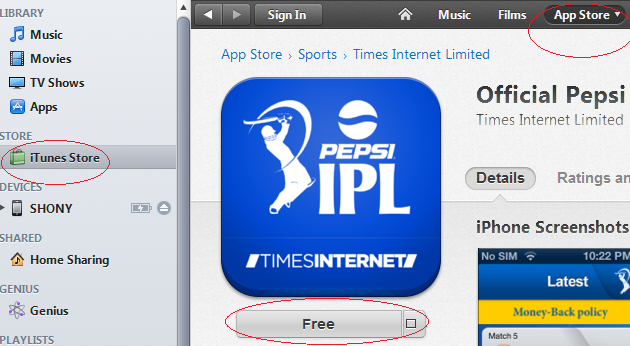 Then click the application which you wanted to install in your phone from the appstore. App store will ask for the apple id password if you are not already connected to the app store. One you provide the apple ID credentials it will start the application download. After successful completion of the application download, select your device in the left hand side menu. Then click on the sync button in the right bottom of the window. This will load the application from your computer to iPhone.